Terry L. Ettinger Horticulture Consulting Services - Recommended Ornamental Grasses for Central New York Landscapes and Gardens. Because I grew up in what once was the heart of the Illinois prairie, I find some of these dramatic and graceful plants are among my all time favorites - such as fountaingrass, right, when its tan-colored fall foliage contrasts vividly against the red leaves and fruit of burning bush and other shrubs. While there will ultimately be dozens of grasses featured here, keep in mind that most - just like the grasses in your lawn - tend to grow best when they receive full sun all day, every day. Also, to keep them looking their best, cut them back to within a couple of inches of the ground in late winter or very early spring, left. 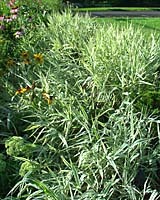 And, finally, though its light green and creamy white variegated foliage is hard to resist, avoid ribbon grass like the plague, right. It spreads rapidly from vigorous underground rhizomes, left, and can quickly infest any landscape and/or garden bed to which it's added!